We pack product in velvet Box. We can pack product as Buyer wants(extra Charge will apply). 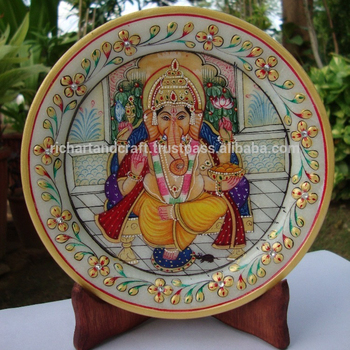 This is highly talented and skilled artists produce the ostentatious paintings onMarble Plate. Miniatures are small, colorful pictures of God Ganesha of India painted in glowing colors. The colors extracted from certain minerals, plant sources, conch shells. Brushes used were very fine. These marvelous handcrafted artifacts from Rajasthan carved out of pure Makarana marble ( the best marble of India) are the distinguished piece of art to enhance the beauty of your interiors.